I think that I can say without fear of contradiction that Arthur Lowe has by far and away the best character in “The Strange Case of the End of Civilization as We Know It”. His Dr. William Watson (the part bionic companion) portrayal against John Cleese as Arthur Sherlock Holmes is absolutely brilliant. This 55 minute made for TV film is somewhat of a steal from Neil Simon’s “Murder by Death” but with a Monty Pythonesque twist. The plot is that Professor Moriarty’s descendant (I won’t say who it is) has threatened all the countries of the world with (insert title of movie here). The descendants of Holmes and Watson are called in by Scotland Yard to save the day. One of the funniest bits is the 5 continent meeting at the Yard and the “we should do nothing” routine. 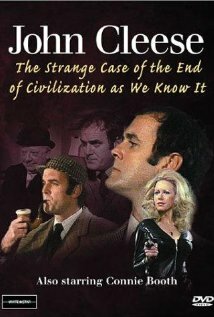 Mrs. Hudson is played by Cleese’s then wife Connie Booth. Also included are all the detective heroes of the day (mid ‘70s): Columbo, Poirot, Sam Spade, James Bond’s M, etc. There are some pretty lame spots in the film overall but it’s really just a quirky hour of entertainment. As I said, the real star of the whole show is Lowe as a dimwitted Watson. 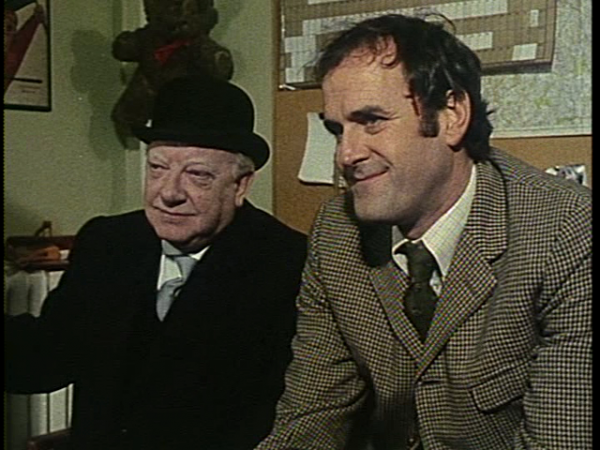 His Watson upstages Cleese’s Holmes through the whole thing. Lowe IS the classic comic interpretation of Watson. It’s well worth an hour even if the ending is a little dim. Arthur Lowe must be one of the best known character actors of British TV and film. 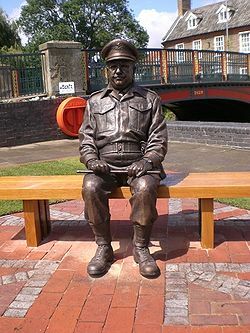 How many people do you know that have one of their characters (Captain Mainwaring of Dad’s Army) made into a statue? Well, okay, Rocky Balboa, but who else? Lowe was born in 1915 on Arthur Guinness’ birthday (22 September). What genius! His father was a railroad worker who organized trains for touring companies of actors (among others) and it was not until the age of 30 that Arthur got into acting professionally. He had wanted to be in the Merchant Navy but was kept out by poor eyesight. The army took him though in WWII and he rose to the rank of Sergeant Major. While in the Duke of Lancaster’s Own Yeomanry in the Middle East he performed in local theatricals. When he left in 1945 he went into the theater for real. He became well known as a character actor and appeared in Pal Joey and The Pajama Game. He married in 1948 to Joan Cooper, an actress he had met at the Manchester Repertory Theater. They were married his whole life. In the 1960’s Lowe tried to split his time between TV, the theater and film. He was busy all the time! He performed on stage with John Gielgud and Laurence Olivier. But his breakthrough was as Captain Mainwaring in Dad’s Army from 1968 until 1977. During that whole time he was doing other TV, radio and film. In his later years he made over 100 commercials for television and though he’d been in a baker’s dozen of TV series and over 50 films he kept performing on the stage. He is said to have had a bought with alcoholism and died the evening of 15 April 1982 after having given an interview on BBC 1 TV at lunch time. On 19 June 2010 his statue as Captain Mainwaring was unveiled at Thetford where the outside shots of Dad’s Army were filmed.